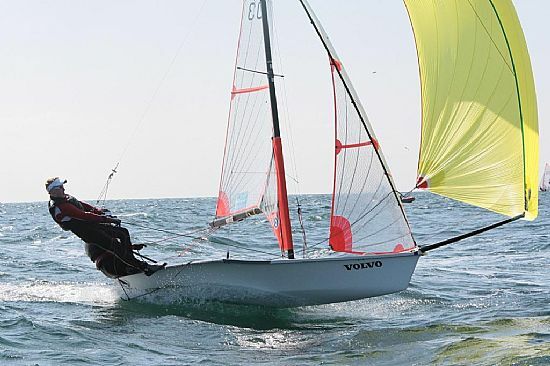 My brother Fraser and I took part in the RYA Volvo Youth Nationals, which was held this year in Pwllheli, North Wales and is the biggest youth sailing event in the UK. 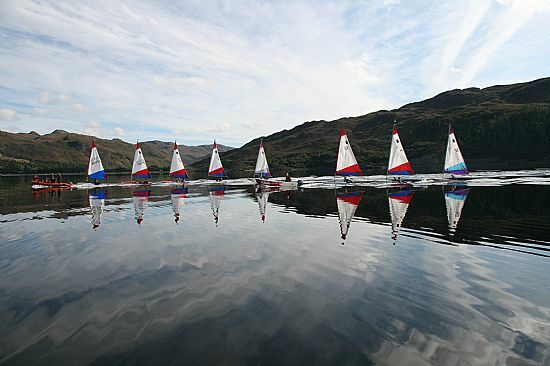 It had a record number of 390 sailors, 144 of which were 29er sailors (72 boats). The fleet was split into two flights for qualifying, yellow and blue, qualifying was done over a two day period and we managed to complete all 7 races however sadly missed out on the gold fleet by two points. This meant we had a good chance in the silver fleet . There was no racing on Wednesday as the wind was gusting up to and above 40 knots so we had to look forward to Thursday which was looking very promising for a good sailing breeze. So Thursday arrived and the wind was strong, 15 – 20 knots, the plan was to do 4 races and three the next day. We started the first race off in style finishing third, which put us in the lead of the whole fleet, so no pressure! The second race came and half way down towards the leeward gate we were lying in 4th place, unfortunately we had a collision with a boat coming up wind and the mainsail came down forcing us to retire from that race, this meant we could not afford to have a bad race for the rest of the regatta. The third race came and we had fixed our sail, the wind had dropped which made the racing very close and we managed to get a 12th place after some close aggressive racing. The last race came and the wind had unfortunately dropped off even more, we knew we needed to get a top 10 finish to keep us in the chase for a top three finish, and we were successful by getting a 9th place which was a relief. After Thursdays racing we lay in 5th position in the silver fleet with our fellow squad boats in front in 4th and behind in 6th . We were still capable of getting a top three finish with good results on Friday. We managed to do three races as targeted, and as the wind slowly picked up we managed to get a 4th place which really gave us a shot at a top three finish. The next race came and we were unfortunately spat out on the start line and forced to sail passed the fleet in last, knowing we had no discards left. We gained our way up the fleet and managed to finish in a respectable 8th place. It was all down to the next race, we had beaten our fellow squad member so we were lying in 4th place and with a good race we could take 3rd or 2nd.Unfortunately the wind dropped and we never got into the race and sadly finished in 15th this put us back into 5th place overall. We were unlucky not to get a top 3 finish however for our first big event we are both pleased with our overall position. 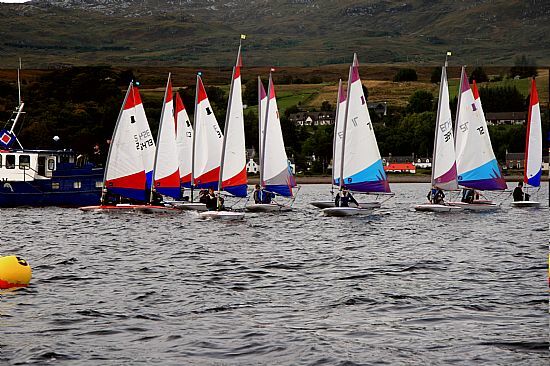 The Youth Nationals is a fantastic event where you get to compete with the best in the country, you gain so much experience and have a great time and I strongly recommend that Lochcarron's young sailors think about what they want to achieve out of sailing and to consider competing in more sailing events to improve your sailing and compare your level of sailing with others. (Seen above are (L to R) Planet Express, The Rebel, Amatory and Escape. Missing from the photo is Saorsa, the ultimate winner. (Sadly Mhojo was unable top compete as she awaits intensive (engine) care in Kishorn.) We are hoping to see the renamed Sassie and Ella for the next race on 15th July. 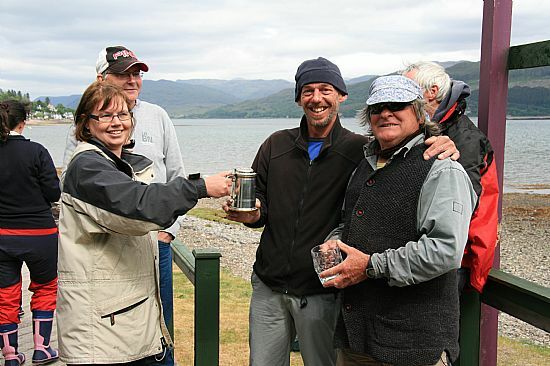 Jenny hands over the winning trophy to Teo and Crew. Remember, all our yacht races are open to visitors. Entry fee: one bottle of wine! 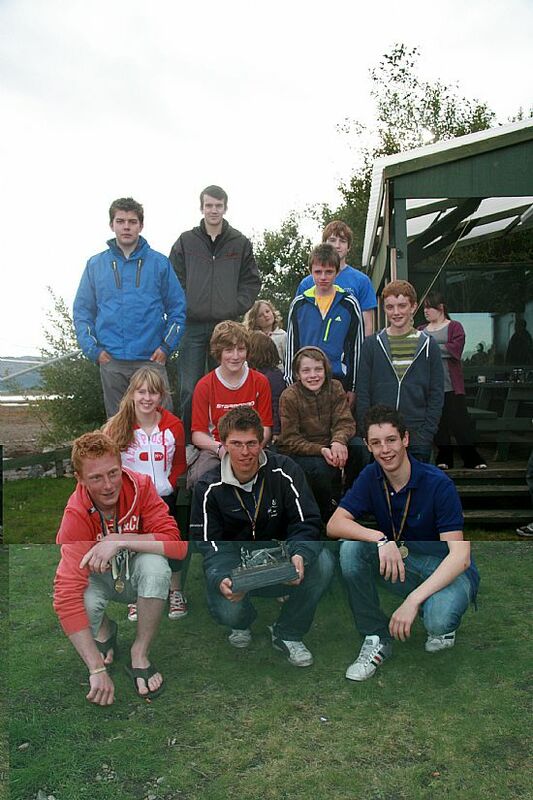 We were joined by two teams from Plockton and one team from Gairloch at the Gunn Trophy this year. In the morning there was no wind at all so we went Seal spotting and played "Catch the tail of the Dog" as we towed the Toppers across a glassy loch. After the barbeque the wind picked up and we were able to sail four competitive races. Here are just some of the sailors (Apologies to the gairloch sailors who had gone off to get changed when this photo was taken. 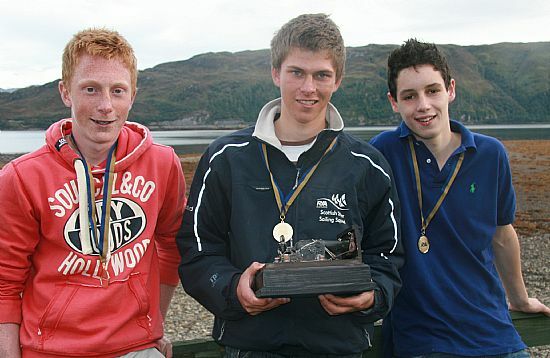 Lochcarron A team (seen here) won the series. Lochcarron B came second, Plockton A third, Plockton B fourth and Gairloch came fifth.